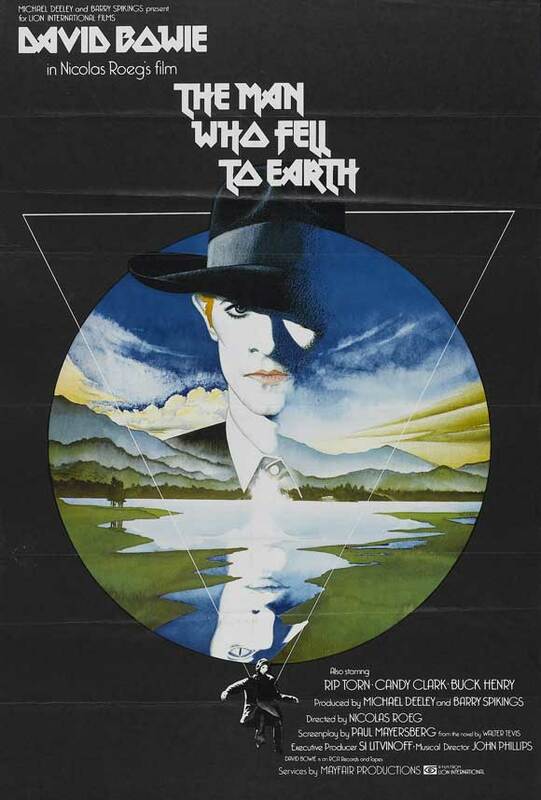 What It’s About: An alien named Thomas Jerome Newton (David Bowie) arrives on Earth planning to bring water to his dying planet. To do so he’ll need to become wealthy enough, and advance Earth’s technology enough, to build a spaceship. Along the way, however, he meets an array of humans, gets too involved with some of them, becomes too fond of alcohol, and eventually loses sight of everything. Why Watch it Today? : David Bowie, was born on this date 67 years ago, seemingly to play this part. Bowie heads an excellent cast in this at times disorienting film from Nicholas Roeg. Other Choices: Bowie’s roles cover everything from historical figures like Tesla to fantasy figures like the Goblin King; one role I found him unexpectedly great in was when he played Pontius Pilate. This entry was posted in Adaptation, Aliens, Arthouse, Based on a Book, Drama, Movie of the Day, Sci-Fi, Speculative Sci-Fi, The Original and tagged Bernie Casey, Buck Henry, Candy Clark, David Bowie, Nicolas Roeg, Rip Torn. Ah… this is one of those films that I recommend to people with the caveat that they cannot hate me the first time they see it. It grows on you over time and I’ve never run into anyone who’s flat out loved it on the first viewing. I might be the exception-I only saw it one time about seven years ago, and I really liked it a lot. I’m not sure I loved it (certainly I haven’t sought it out again, but I rarely re-watch anything but my tried and true favorites these days) but it was a great movie to see. It probably helped that I saw it at a great theater, the Coolidge Corner, as part of their “Science on Screen” series (http://www.coolidge.org/programs/science-on-screen). The series pairs a film with an academic, who gives a short lecture before the film. In this case it was an anthropologist, talking about the alienation that happens to people who move alone to a completely different culture; it really helped frame how I experienced the movie.